Here are several stats you may not know from the Packers 30-13 win over the Minnesota Vikings on November 22 (the stats all reflect regular season games unless otherwise noted). With a 30-13 win in the 3:25pm game time start, the Packers have now won eight straight in Sunday games that have started in the late afternoon (3pm to 430pm starts, local time). In the Mike McCarthy era (since 2006), the Packers are 25-8 (.758 winning percentage) in these games, and are 20-5 in these games dating back to 2010. Green Bay scored in the first quarter on a pair Mason Crosby field goals. They have now won 14 of their last 17 when they score in the first quarter of a game. Since 2000 they are 119-49-1 (.707) in these games. They are 48-10-1 (.822) since 2000 in division games when they score in the first quarter. The temperature at game time was 30 degrees. The Pack is 11-1-1 in games that start in temperatures below 32 degrees since 2010. Those 13 games are the most in the NFL since that year. Mason Crosby tied his career-high with five made field goals (he had five versus Detroit on October 6, 2013 at Lambeau Field). Green Bay is 11-0 when Crosby has made four or field goals in a game; they are 17-0 when Crosby scores 13 or more points in a game. The Pack had a 10-point lead at halftime. They are now 64-5 in games since 2000 when they are ahead by 10 or more points at half. They are 19-4 in road games since 2000 with a 10-point or larger lead at halftime. In the three Packers losses they have scored nine times in 38 drives (26.7 percent). In their seven wins they have scored 35 times in 71 drives (49.3 percent). They are 5-0 in the five games where they scored on 50% or more of their drives; they are 2-3 in games where they scored on less than 50 percent of their drives. In the seven Pack wins, they have 29 sacks. In their three losses, zero sacks. Eddie Lacy carried the ball 22 times for 100 yards. Green Bay is now 6-1-1 when Lacy gains 100 or more yards in a game; they are 11-2-1 when Lacy carries the ball 20 or more times in a contest. The eight games in between yesterday’s 100-yard game and the last time he gained 100 yards rushing in a game was the longest stretch of games where he gained less than 100 yards in a game. James Jones had six catches for 109 in the game. The Pack is now 9-3 in games where he tallies 100 or more yards receiving. Jones has 38 TDs in his teams’ 79 wins and 12 TDs in his teams’ 50 losses. Minnesota running back Adrian Peterson carried the ball 13 times for 45 yards in the game. In 14 regular season games against the Packers Peterson has rushed for over 100 yards eight times. The 45 yards in yesterday’s game tied his career-low against Green Bay. On November 11, 2007, his rookie season, he had 45 yards on 11 carries versus the Packers. The Packers are now 87-7 since 2000 in games where they score 30 or more points; they are 34-1 in division games. They are 59-1 since 2000 in games where they allow less than 14 points in a game; they are 26-1 in division games. Aaron Rodgers was 16-for-34 in the game, completing 47.1 percent of his passes. It was the sixth game he started in his career where his completion rate was under 50 percent. The Packers are now 3-3 in those games. 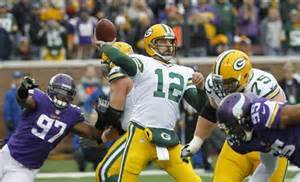 In games where Rodgers completes under 60 percent of his passes, Green Bay is 11-18. The Packers had six sacks and five made field goals… it was only the 17th time in the NFL in the Super Bowl era (since 1966) that a team had six or more sacks and five or more field goals in the same game. It was the first time for the Packers in their history.